Dynamite Entertainment is proud to announce their agreement with rights holders Galaxy Publishing and Valdoro Entertainment to publish original comic book and graphic novel content for Sheena, Queen of the Jungle, as well as reprints of the character’s classic jungle fantasy material. Described by co-creator Will Eisner as a female counterpart to Edgar Rice Burroughs’ Tarzan, Sheena will see her first adventure at Dynamite Entertainment teaming with the iconic “Lord of the Jungle” himself. Dynamite’s rights also include statues, trading cards, action figures, lithographs / fine art, and t-shirts. Sheena, Queen of the Jungle was created by industry legends Will Eisner and S. M. “Jerry” Iger, and debuted in the UK publication Wags #1 in 1937 (reprinted a year later in the United States in the pages of Jumbo Comics #1). She was the first female comic book character to carry a dedicated series, preceding Wonder Woman #1 by four years, and her series spanned 167 issues and twenty years. Sheena began her fictional existence as an orphan raised by a shaman in the jungle, perfecting her survival skills and mastering the ability to communicate with animals. Her many adventures brought her into conflict with evil hunters, slave traders, and rampaging wildlife. The character has thrilled audiences in several television and film adaptations, including portrayals by actresses Irish McCalla (1955-1956), Tanya Roberts (1984), and Gena Lee Nolin (2000). Dynamite Entertainment has a long history of publishing jungle fantasy and pulp adventure, making it the perfect home for Sheena, Queen of the Jungle. 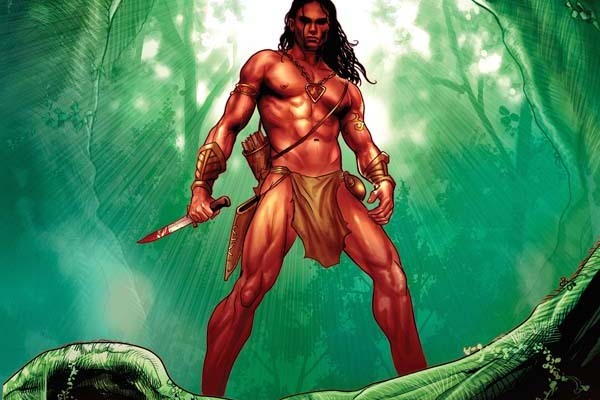 The iconic hero Tarzan appeared in the company’s Lord of the Jungle series, as well as the related title Lords of Mars. Dynamite has also published Frank Cho’s Jungle Girl, the Frank Frazetta-created Thun’Da, King Features Syndicate’s The Phantom and Jungle Jim, Alan Quatermain (of King Solomon’s Mines) as a supporting cast member in Prophecy and Savage Tales, and Turok: Dinosaur Hunter. Dynamite’s Sheena, Queen of the Jungle comics will be solicited in upcoming editions of Diamond Comic Distributors’ Previews catalog, the premier source of merchandise for the comic book specialty market. Comic book fans are encouraged to reserve copies of Sheena-related projects with their local comic book retailers. Individual customer purchases will be available through digital platforms courtesy of Comixology, Dynamite Digital, iVerse, and Dark Horse Digital. Fans and retailers are encouraged to follow Dynamite Entertainment’s official social media channels for the latest updates regarding project development and release dates.